We're gangin on a bear hunt. We're gaun tae catch a braw yin. Whit a bonnie day! We're no feart. Get ready for a big adventure, as brave hunters and bear lovers trudge through muckle forests and skirlin snowstorms, claggie mud and a deep cauld river in search of a glowerin bear. Michael Rosen and Helen Oxenbury's classic We're Going on a Bear Hunt is charmingly recreated in Scots for little adventurers. 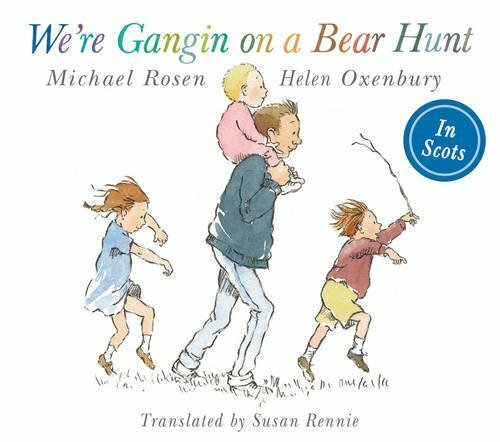 The original words and illustrations are transformed by language expert Susan Rennie into lively Scots for a bright and bonnie take on this favourite tale.